I read one morning last week about a fellow quilter who lost her grown step daughter suddenly a few weeks ago. I can't even imagine that pain. That family stayed in my mind all day as I grappled with the enormity of losing a child. Somewhere along the way, it made me think of my grandparents, who lost their firstborn in infancy. I can just barely remember when I learned that the 13 siblings in Dad's family actually had another brother who had died as a baby, but I can't say I've ever thought about him much. I certainly never thought before that day last week about how it must have been for the young Eileen and Michael to lose their son, probably because I never heard anything about what it was like for them. By the time I learned about the child who died, both of my grandparents were gone as well. I know I've said this before, but one of the things I find hardest about reading the Bible is that it gives us all the facts, but very few of the details. It is so easy to skim over really hard, painful stuff without taking in how hard and painful it was because there are no details to help us make that connection. Just look at the moment when Pilate "ordered Jesus flogged with a lead-tipped whip, then turned him over to the Roman soldiers to be crucified" (Matthew 27:26). That comma between ordering that Jesus be whipped and giving Him to the soldiers to be crucified, that comma is all that represents the actual whipping. If that were written in a modern-day novel, that one comma would be rendered as a full paragraph or more. Readers would be given details about the man who did the whipping, the sound of the whip through the air, the sound of it hitting Jesus' back, the sounds Jesus made as lash after lash landed. It's not easy to think about, is it? And so, often, we don't. We read the facts as they are written in the Bible, but we don't slow down enough to consider the details that would have gone along with those facts. Along the way, we lose the emotional connection we could have with the facts. It's not only the hard, painful things that we miss because of the lack of details. Think about the moment when the thief crucified next to Jesus said to Him, "'Jesus, remember me when you come into your Kingdom.' And Jesus replied, 'I assure you, today you will be with me in paradise'" (Luke 23:42, 43). What did Jesus' face look like in that moment, when He looked at this man who believed and so would spend eternity in heaven because of the agony Jesus was feeling at that exact moment? I picture a smile through the pain as He saw a glimpse of just how worth it that agony would prove to be. Did He close His eyes for a moment as a feeling of victory washed over Him? Did He choke up a little as He spoke, overwhelmed with love for this sinner who had come home? 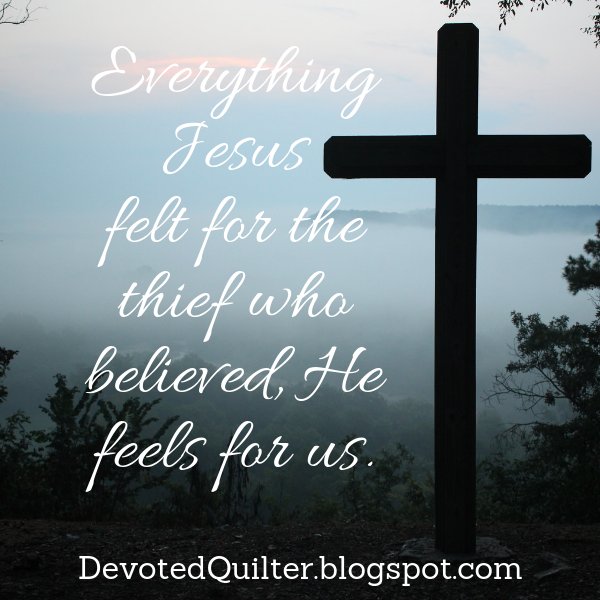 Everything Jesus would have felt in that moment, for that thief, is what He also feels for every other sinner who believes in Him. It's what He feels for you and for me. Without the details, though, it's all too easy to read the story without ever thinking about what Jesus was feeling. Obviously, the Bible couldn't possibly contain all the details a novel would include. If it did, the Bible would be large enough to fill a room! But there's no reason we can't slow down and imagine those details and so allow ourselves to feel that emotional connection with the facts we read. My challenge for you this week is just that - when you read the Bible this week, read slowly. Imagine the details that aren't written and allow those details to connect you more deeply with the facts. Keep writing! You are so helping us to grow spiritually. Thank you for this post. I know the words of the graphic are true, but I’ve never seen that truth expressed as you did.